HappyStepz: Starting 2016 with a splash. Tales of surviving the New Year’s dive. Starting 2016 with a splash. Tales of surviving the New Year’s dive. First of all, happy New Year to all you happiness frontiers out there. Hope you've had a wonderful New Year's Eve and a smashing beginning of 2016. How did you spend the first day of 2016? Do you have a tradition how to spend the first blank page of your 365 page book? This leap year gives us an extra page to write wonderful new adventures. Most of us spend New Year’s Day recuperating from the night before, barely making it out of bed. Some visit family members, others make New Year’s resolutions mostly containing the resolution never to drink again. Then there are a few traditions that are a bit out of the ordinary. 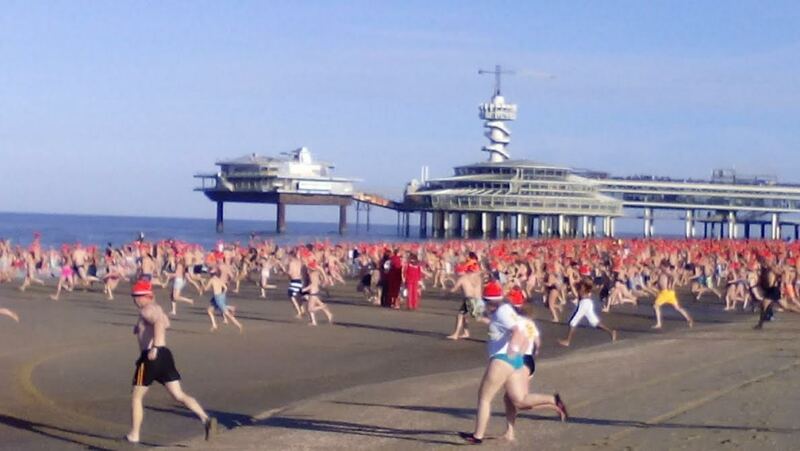 We Dutchies have a little crazy tradition on New Year’s Day. On January 1st at precisely 12 PM we jump into the North Sea. Obviously not everyone does this. Only the ones who are brave enough and a tad insane dare to face the freezing cold. This may sound absurd. Why would anyone in their right mind get into their swimsuit and dive voluntary into freezing water? The benefit out ways the cold downside to this event and it is actually a great way to start the New Year. The dive into the North Sea started in 1965 when only seven people dared to participate. Today tens of thousands of people venture into the sea. Running at full speed and taking a dive into the sea gives a fulfilling and proud feeling that will last all day long. It is both refreshing and adrenaline pumping. All those endorphins jumping through your body making sure you receive a wonderful happiness boost to start the year. It feels like a new beginning while washing away any remnant of bad memories. If this isn't reason enough for you to join the other crazy Dutchies, for only three euros entrance fee you also get a lovely goodie bag filled with a orange beanie, a can pea soup, and a ribbon. One euro out of every three is donated to a good cause. There is no better way to start the year. Just remember to bring warm socks for your frozen feet to wear afterwards. Maybe next year your can start writing your 365 page book with a splash as well and join us with a dive into the North Sea.